The survey is totally anonymous and is open to all Kennel Club Registered Italian Greyhounds. It is designed to be quick and easy to complete and at the same time provide us with on going information on the health of the breed, the ages of Italian Greyhounds, and any health problems that they are suffering. The results will be published and will enable us to monitor health and act quickly if any conditions are arising, which could cause on going problems for our breed. It is important that all owners complete the survey, including healthy dogs, so as we can get the fullest picture of the breed’s health. Please take five minutes to complete the online form, (one for each dog). The survey will be repeated every two years to enable us to rigorously monitor the breed’s health. Always register with a vet as soon as your bring your Italian Greyhound home. Vets can be a fantastic source of advice and support, particularly if you are a first time owner. The Italian Greyhound Club will also happily put you in touch with experienced Italian Greyhound owners if you want advice on the breed in general. Speak to your vet about all of the vaccinations and boosters that your dog will need through its lifetime and ensure that they are kept up to date. 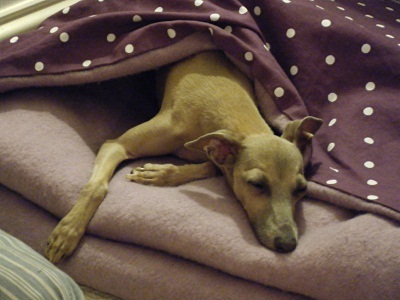 Make sure you read our advice on aspects of caring for an Italian Greyhound on this website. In relative terms Italian Greyhounds are a healthy breed but there are also some key health issues that owners need to be aware of. Broken legs are one and Perindontal Disease and Epilepsy are two of the others that are causes of concern. Italian Greyhounds have long, fine leg bones that are a bit like pencils – and we all know how easy it is to snap a pencil. However it is not the norm for every Italian Greyhound to break a leg. Accidents can happen to any dog – as with humans. Use your common sense and you will go a long way to preventing nasty accidents e.g. don’t let puppies leap off furniture onto hard, polished floors, don’t let your dogs run in rutted or pot-holed fields but do let your dogs run so they build strength and also learn to run safely. Those who are coming into the breed for the first time and searching for a companion dog should ask any potential breeders about whether or not the sire and dam have had problems with leg breaks. And use your eyes – an overly-fine dog that looks fragile probably is fragile. Always insure your dog – especially puppies. It can cost thousands of pounds to have a broken leg re-set properly by a specialist orthopedic vet. Periodontal disease is the most common infectious disease in all adult dogs and is the main cause of dental disease and early tooth loss in dogs, affecting over 87% of dogs over three years of age and Italian Greyhounds are included! It is very important to look after your dog’s teeth to help prevent gum disease and tooth loss later in life. Daily brushing with a soft toothbrush (a children’s toothbrush from your local supermarket or pharmacy is fine) and a canine toothpaste is essential. It is unfortunate too that there are some bloodlines in the UK that carry inherited epilepsy, an area of ongoing research for the Italian Greyhound Rescue Charity and Animal Health Trust – see the Research into Epilepsy page. Healthy Italian Greyhounds should not suffer from seizures or have ‘little turns’ and any breeder that tells you that should be avoided.